C-Frame Vacuum Lifter facilitates sheet and panel inspection. With Upender 180Â° Flipper, one person can lift, inspect, and reposition wood, plastic, and composite sheets and panels. System uses electric worm gear drive actuators and features 8 double spring-loaded vacuum suction pads to assure even loading and stress-free handling. Capable of handling 4 x 8, 5 x 10, and 6 x 12 ft sheets and panels, hydraulic-free lifter includes pendant control and VLS-08 Vacuum Leakage Sensor for safety. A new, fully powered C-frame style vacuum upender 180° flipper that lets one person lift, inspect, and reposition wood, plastic, and composite sheets and panels is being introduced by Anver Corp. of Hudson, MA. 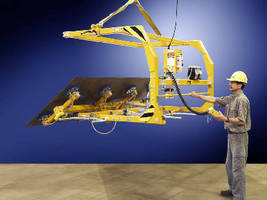 Anver's Upender 180° Flipper is a C-frame style lifter that lets one person lift sheets and panels, invert them, inspect the other side, and then place them in jigs for assembly or secondary operations. Featuring eight double spring-loaded vacuum suction pads to assure even loading and stress-free handling, this inverter uses clean electric worm gear drive actuators. Capable of handling 4' x 8', 5 x 10', and 6' x 12' sheets and panels, Anver's Upender 180° Flipper is ideal for finishing operations because it is hydraulic-free. Suction pads are offered in many sizes made from various rubber elastomers. Standard features include a pendant control and a VLS-08 Vacuum Leakage Sensor to provide leak detection safety. Anver's Upender 180° Flipper is priced from $10,995.00 up, depending upon special customer requirements. Price quotations are provided upon request.